The No. 9 hitter in a baseball lineup is historically considered the worst of the nine. However, as baseball evolves and changes, tradition is set aside for experimentation. Some managers in the big leagues have chosen to hit their pitchers eighth and a position player ninth and some college coaches have opted for a speedster in the No. 9 slot to give their program a double-leadoff threat. Vallejo Admirals manager P.J. Phillips hits one of his top power and on-base threats ninth. That’s youngster Chris Fornaci, 24, who joined the Admirals last season in the middle of the championship push and helped solidify the team’s infield defense. Fornaci has continued his excellent work with the bat and the glove in 2018. He is fifth in the Pacific Association in homers (14), ninth in RBIs (38), 11th in on-base percentage (.413) and 12th in OPS (.979). Fornaci is from nearby Walnut Creek and graduated from De La Salle High in Concord. He initially was a free safety and wide receiver on the football team but eventually decided to concentrate on baseball exclusively. Fornaci said he never hit for much power in high school. Fornaci was a recruited walk-on at Pepperdine. The Waves won the West Coast Conference twice during his tenure. In 2014, they won the Cal Poly Regional and then were three outs away from getting to the College World Series in the TCU Super Regional before being eliminated. Two years later after his senior year, Fornaci thought he had a shot to get drafted by a Major League Baseball organization but the draft came and went. “You have scouts telling you that you’re going to get drafted and you go to pre-draft workouts but it’s still a crap-shoot until you hear your name called,” he said. Fornaci could not find a professional baseball job in 2016 but in 2017, he opted for the Southern Illinois Miners of the independent Frontier League. Unfortunately, he did not pick up a hit in 21 at-bats and was released. Fornaci began sending emails around to other professional teams. Phillips said he happened to check his email one day and thought Fornaci would be worth a look. “Just from looking at the email, it seemed like he could play for me and I gave him a shot and he’s taken advantage of it,” Phillips said. Fornaci said Phillips as well as outfielders Tillman Pugh and Nick Akins Sr. had a big impact on him after he came aboard. Pugh graduated from De La Salle as well but the two did not know one another. 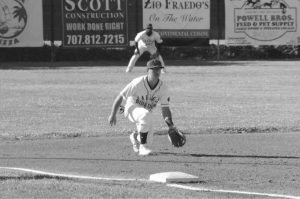 Fornaci hit a huge home run in the Pacific Association championship game win against Sonoma and was rewarded with the league’s Defensive Player of the Year for third basemen after the season. Fornaci said he was a second baseman up until his junior year at Pepperdine. He said he was a poor defender that season since he had never played the position. During the fall of his senior year he worked with ex-Pepperdine shortstop Zach Vincej, who went on to play in the Cincinnati Reds and Seattle Mariners organizations. Fornaci acknowledged that some of the fields in the Pacific Association can be a challenge. Fornaci might be well known around the Pacific Association for “taking one for the team,” or hit by pitches. He was first in that category last season despite playing in only 56 games and is second this season with 13. (Napa’s Jordan Anderson has 14). Fornaci said the thought of not always moving out of the way of a pitch started at Pepperdine and carried over to the Admirals. He owns the Waves’ single-season record for getting hit with 24 during his junior year. Still, he noted it’s something he doesn’t necessarily want to be known for. “I’ve tried to get better as far as getting out of the way because you want to hit … I want to hit,” he said. Phillips mentioned that Fornaci has the age and tools to get picked up by an affiliated club. That’s what Fornaci wants … and then some.